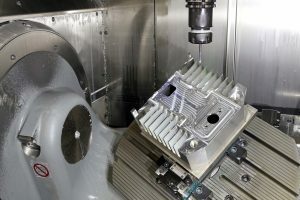 A third 5-axis, vertical-spindle machining centre has been installed by subcontractor Hemlock Engineering, Nottingham, in response to a steady increase in work from a variety of sources. Aircraft seat parts, medical prostheses, components for laser equipment used in dentistry and printing, fire suppression nozzles and parts for camera tripods and beer pumps are typical of the diverse range of contracts regularly received from more than 200 customers. Even though 95 per cent of jobs undertaken by Hemlock are in aluminium, high power and torque are still needed when taking deep cuts to prevent the cutter stalling. The latest Hermle C 22 U, supplied through UK agent Kingsbury, is a robust, 5-axis model capable of highly productive metal removal using the 25 kW / 80 Nm / 20,000 rpm spindle and 45 m/min rapids. Working envelope is 450 x 600 x 330 mm. Two factors distinguish the C 22 U, in the view of Hemlock’s managing director, Paul Cobb. First is the machine’s reliability, as it has operated faultlessly since it was installed in March 2013. Second is its ability to hold extremely high tolerances, down to a few microns on some optical parts used in dental laser equipment. He also commented that there were less expensive machines on the market than the Hermle, but it was by no means the costliest. In any case, the price of a machine tool is of secondary importance. It is uptime that is crucial to maintain output and profitability.